Animal Assisted Activities such as Canine Therapy offer many physiological and physical benefits to those in need. The Delta Society defines AAA as providing opportunities for motivational, educational, recreational and/or therapeutic benefits to enhance the quality of life. 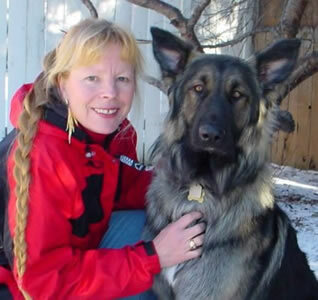 Official AAA organizations require very stringent temperament testing for all dogs participating in their programs. Multiple Shiloh Shepherds have proven themselves to be socially confident in character, predictable and reliable in nature, remarkably intuitive - demonstrating the most gentle affection with fragile persons & children. Official AAA organizations require very stringent temperament testing for all dogs participating in their programs. Multiple Shiloh Shepherds have proven themselves to be socially confident in character, predictable and reliable in nature, remarkably intuitive - demonstrating the most gentle affection with fragile persons & children. The International Shiloh Shepherd Club applauds each and every one on our growing list of registered Therapy Dogs! These Shilohs are serving across the country in schools, hospitals and nursing home facilities - and bringing joy wherever they go! 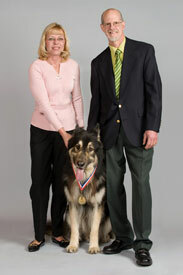 Takoda, owned by Cindy Schleifer, has been inducted into the New Jersey Veterinary Medical Association Animal Hall of Fame for this therapy work, March 2008. The NJ Veterinary Medical Association honors animals in Companion, Therapy, Professional, Hero and Animal Welfare. NJ vets nominate an animal from their practice that exemplifies the human-animal bond.